Looking for something really original for your next team building / Incentive event in Spain or Gibraltar ? Look no further, the wine casino nights are the solution ! Experience Box will organize these wine casino events at you hotel or any suitable location, all depending on the size of your group. So what is a wine casino night ? The event can be organized individually, but we think it is more funny and more constructive (in a corporate vision) to set-up several teams. Our expert event manager will explain the event and will do a 10 minute speech about how to recognize a wine: color, taste, texture, etc… and how to recognize the region where the wine has been produced according with its characteristics. 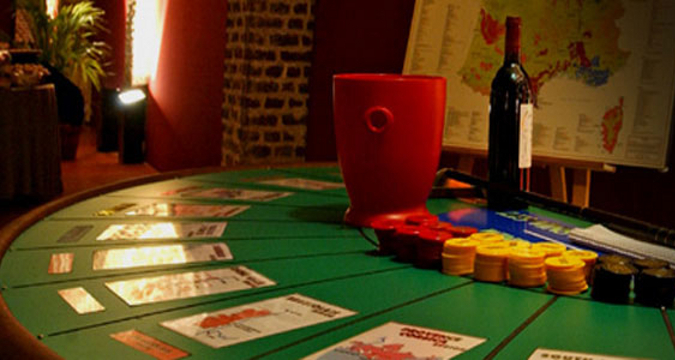 At the end of the wine casino contest, the winning team will be elected and a prize offered. We include pictures of the event, event manager, etc. The wine casino is a great activity for team uilding as it can be organized in your hotel of residence, for groups of 20 to 300 participants.